News - May Newsletter: Ubiquitin-Proteasome System as a Therapeutic Target: Does Tubulin Care? 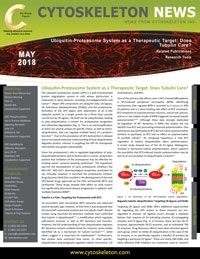 May Newsletter: Ubiquitin-Proteasome System as a Therapeutic Target: Does Tubulin Care? The ubiquitin-proteasome system (UPS) is a well-characterized protein degradation system in cells whose dysfunction is implicated in many diseases, including neurodegeneration and cancer. Major UPS components are ubiquitin (Ub), Ub ligases, Ub hydrolases (deubiquitinases [DUBs]), and the proteasome. Activation of the UPS begins with attachment of an 8 kDa ubiquitin protein to a target protein by a three step cascade carried out by Ub ligases. Ub itself can be ubiquitinated, leading to poly-ubiquitination, a marker for proteasomal recognition and ultimately degradation (Fig. 1). This is an oversimplification as there are several unique Ub specific chains, as well as mono-ubiquitination, that can regulate multiple facets of a protein’s function. Due to the prevalence of UPS dysfunction in disease and an increased molecular understanding of how ubiquitination degrades protein, interest in targeting the UPS for therapeutic intervention has grown substantially.